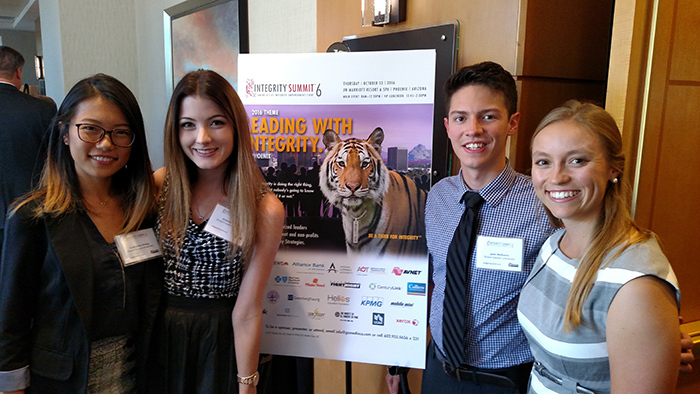 Four of the eight Colangelo College of Business students who got to witness the Integrity Summit: From left, Catherine Ziong, Chelsea Evans, Josh McGuire and Brittany Holen. 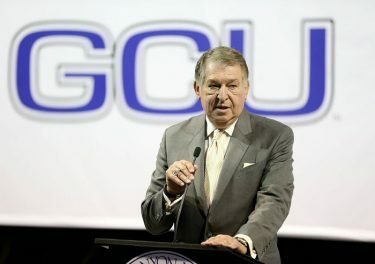 It’s only natural that a college named after Jerry Colangelo is built on integrity. But students in the Colangelo College of Business at Grand Canyon University don’t just hear that word a lot in the classroom — they also have the privilege of meeting community leaders who preach it and, more important, live it. 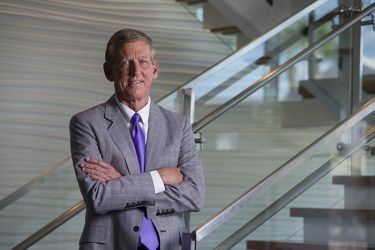 During 4½ extremely educational hours, 18 “Integrity Tigers” — including Colangelo, GCU President Brian Mueller and Phoenix Mayor Greg Stanton — talked about what integrity means to them and why they’re so committed to it. Incredibly, there was no overlap or repetition in such a consistent message. “The one thing that I think is really cool is that a lot of these speakers are from big companies,” Brittany Holen said. “We’re getting to see that there are companies out there that are focusing on integrity and that it’s a core value. Colangelo had young people in mind when he got the idea for the event six years ago while on a trip to a college campus. During his talk there, he asked the students how many of them had ever cheated on a test and was stunned — and disappointed — when virtually everyone’s hand shot up. What’s happening in America today only furthers his resolve. “Integrity would solve a lot of problems,” he told the audience. Erik Olsson, president and CEO of Mobile Mini, the portable storage company, addressed cheating during his talk by first telling the story of how one of his employees fraudulently changed a driver’s log to get a shipment to a customer on time. The customer was delighted, but Olsson said that misses the point. The employee was fired. He then shared the results of a survey of Rutgers University students asking whether they had cheated in the last year. The audience could select one of four choices for how many students said yes – 3%, 38%, 68% or 98%. That hit home with the GCU students. The other speaker who seemed to really hit home with the GCU students was Lisa Daniels, managing partner of KPMG, one of the country’s biggest auditors. Daniels examined the reasons people lie on the job and suggested ways companies can support integrity, such as having open and honest communication, creating a culture that aims to serve a higher purpose, and striving for an environment that doesn’t make employees so afraid to make mistakes. She underscored her point by telling of how, during a 30-day audit of her firm’s integrity, she caught herself telling exactly the type of “white lie” that was being audited. Mueller began his talk by noting how the derivative of the word “integrity” first was used by the Roman army to imply there were no divisions, and he then told the story of how his mother used to visit a nursing home regularly because she didn’t think it was right that anyone should be forgotten. Dr. Randy Gibb, the CCOB dean, attended the Summit for the first time last year and knew right away that it was something he needed to share with students. Who knows? Maybe one of them will be an Integrity Summit speaker someday. Nothing could make Colangelo prouder.